Exit at I-595, proceed west to University Drive exit. Turn left (south) onto University Drive. Proceed approximately 1 ½ miles to SW 30th Street (Abe Fischler Blvd. ), turn left (east). Take first right on SW 76th Ave into NSU's Health Professions Division. Proceed to the Parking Garage (you can also park your car on the surface lot). From North of I-595 – Take University Drive south 1 ½ miles past I-595 to SW 30th Street (Abe Fischler Blvd). Turn left (east). Take first right on SW 76th Ave into NSU's Health Professions Division. Proceed to the Parking Garage (you can also park your car on the surface lot). From South of Griffin Road – Take University Drive north approximately 2 miles past Griffin Road to SW 30th Street (Abe Fischler Blvd.). Turn right (east). Take first right on SW 76th Ave into NSU's Health Professions Division. Proceed to the Parking Garage (you can also park your car on the surface lot). From Miami Heading North or West Coast/Naples Heading East – Merge onto I-595 eastbound (towards Fort Lauderdale). Exit at University Drive exit, turn right (south). Proceed approximately 1 ½ miles to SW 30th Street (Abe Fischler Blvd. ), turn left (east). 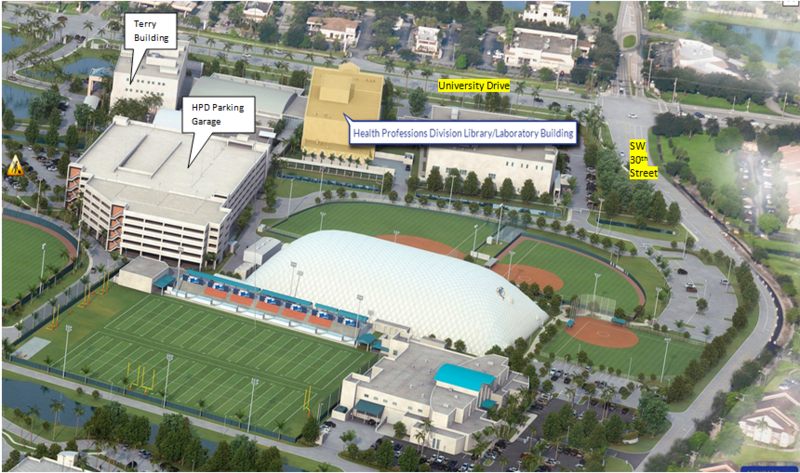 Take first right on SW 76th Ave into NSU's Health Professions Division. Proceed to the Parking Garage (you can also park your car on the surface lot). Once you park and get down to the first floor from the HPD Parking Garage, next to the elevator on the right side, take the covered walkway straight to the glass door. Once you go through the glass door, pass the JuiceBlendz, come through the door on your right and you will see the library.